"...The Arcane, a race of blue-skinned giants, sell all the tools necessary to make the long journey to wildspace. These tools consist of a ship, a helm, and a star to steer by. The ship can be common enough: A Xebec, Galleon, Cog, or even a Coaster like those we see pull into the ports of Waterdeep every day of the week. Or they can be the fantastic Squid, Angelship, Hammership, or Cuttle Command. Many wonder how these ships can move without wind, and I'll tell you. Instead of sails that draw power from the wind, spelljammers simply gain power from the magic of the spellcaster who pilots them..."
"Multitudes of worlds wheel through Wildspace. The crystal shells that encase them bob and drift in a turbulent, rainbow ocean which fills all the cosmos. Sturdy merchants, bold pirates, and daring explorers venture into the great, unknown vastness of the universe, seeking wealth and adventure. • Full-color, stand-up pieces for playing out tactical battles and encounters in space." More photos at our Game Gallery. 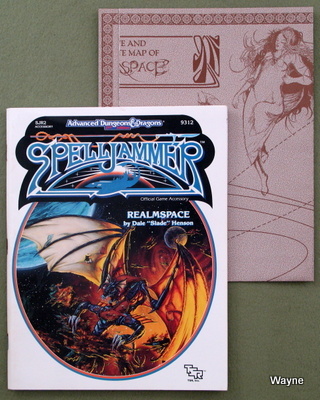 "Feared by some, hunted by others, the awesome vessel Spelljammer glides through the vastness of space on manta wings. For the first time ever, the myths surrounding the Great Ship are unveiled, allowing you to expand your SPELLJAMMER game campaign. 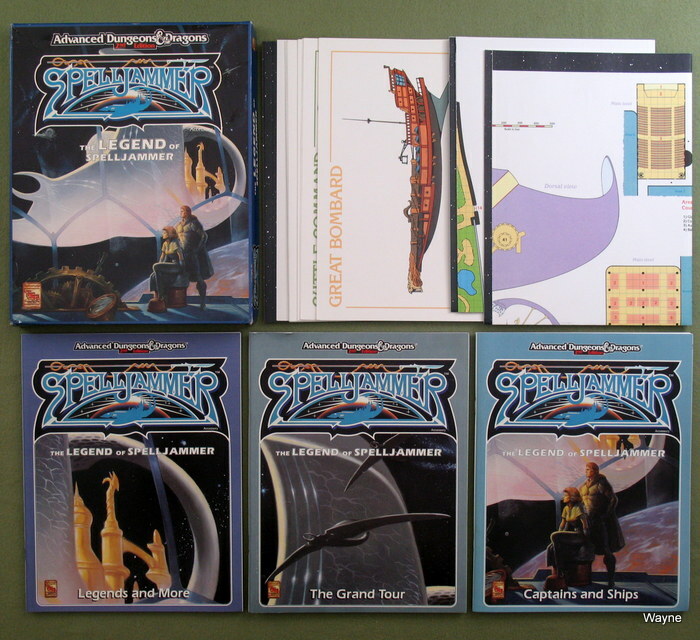 This accessory is an epic adventure setting for use with the original SPELLJAMMER Adventures in Space boxed set. 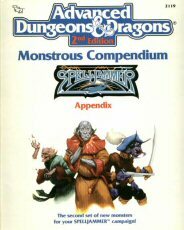 Within this box you will discover new monsters and races, exciting new ships and characters, plus the fantastic Spelljammer itself." "The worlds of fantasy space are legion. Not all are friendly. The spider-like Neogi slavers, the cold and calculating Mind Flayers, the savage Scro, and others all build great ships of war to catch the magical currents of space. * Ship-to-Ship game: Tactical ship rules and two 22" x 31" mapsheets with an extra-large hex grid. 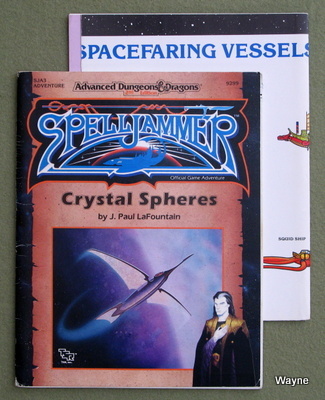 * Three complete books: Over 190 pages of vital information designed to expand your SPELLJAMMER campaign setting. * Additional game cards: 6 full-sized 8½" x 11" cards: player aid cards, game markers, and three new color ship cards (Clipper, Quad of Thay, and Triop -W). 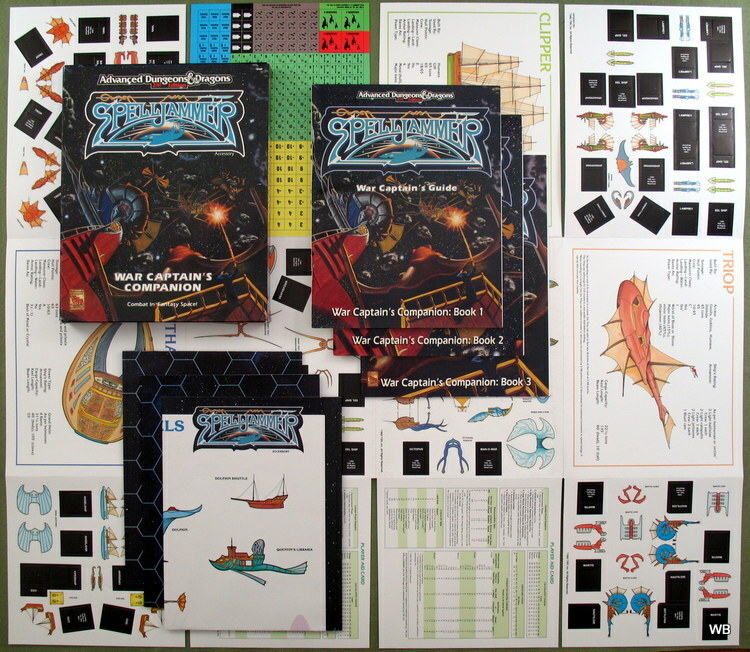 * Colorful playing pieces: 6 sheets of full-color 3-D ship pieces, over 30 ships in all. * New role-playing rules, including new character skills and magical items. * New section allows creative players to design their own ships. * War fleet and shipyard bases for our major campaign worlds! * Updated and expanded information on all existing ship types. * Each ship in this book is accompanied by a detailed line illustration. * Introduces over a dozen ship types for the first time anywhere! * Easy-to-learn ship-to-ship rules that will give hours of enjoyment. * Includes ramming, boarding actions, magic use, and much more. * Optional rules feature 3-D movement and advanced weapons and equipment!" "Far off the traveled paths of wildspace, a lone crystal sphere bobs in the phlogiston, waiting for unwary visitors greedy for adventure. This is the Astromundi Cluster, a setting easy to find... and nigh-impossible to escape. * A 32-page player's manual to the factions and features of Clusterspace. The Astrogator's Guide gives players all the information they need about the races and major asteroid clusters of the Shattered Sphere, life and culture in the Cluster, and new ship and weapon types. * A 64-page DM guide, Adventures in the Shattered Sphere, which reveals to the DUNGEON MASTER the secrets of the Astromundi Cluster, from the magically powerful Antilan Empire to the behind-the-scenes plots of the Arcane. 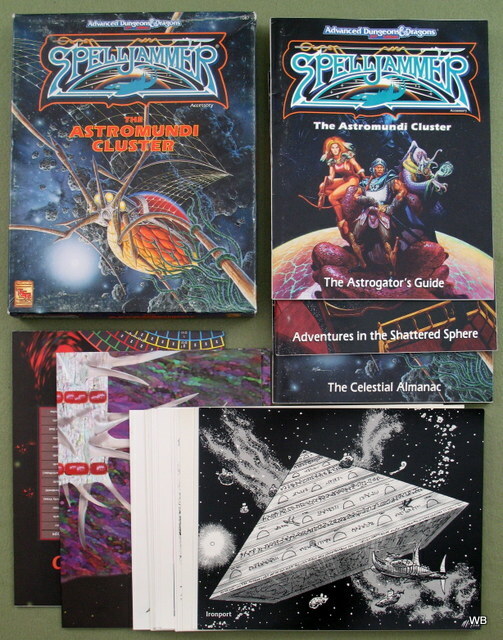 * A 96-page DM book describing in full detail the most important asteroids and other features of the Cluster, its physical makeup and economy, and new magic and spells. * Two full-size maps illustrating the planetary orbits of the Cluster's celestial bodies, and schematic layouts of a feared crystal citadel and important trading post. * Twenty-four cards filled with ship blueprints, important faction illustrations and descriptions, orbital maps, and more." "Who among you who have dared to enter the starry deeps has not heard of the dark drifting derelicts of earlier spacefarers? The silent, menacing lairs of monsters that may hide great treasures for those bold enough to explore them? And what space-captain plies the spacelanes who does not dream of a bigger, sleeker, more powerful ship than his present one? * New spells to better arm intrepid adventurers. * New Ships! Twenty new ship types. * Flotsam of Space - mini-menaces that can bring space to exciting life. * New rules to help DMs run extended space adventures. * New adventures galore that can make any spacebound AD&D game campaign an exciting (and dangerous!) place for your characters!" Connects to the Forgotten Realms campaign. "Toril: that blue-green orb on which live Elminster, Lhaeo, and the Harpers, to name but a few. The planet so many adventurers call "home." To many, it seems to be the center of the universe. • a full-size poster map of the Realmspace crystal sphere, showing all the planets in their relative orbits. • Statistics on new ship types, including the Batship and the Tsunami. • Several short adventurers, suitable for introducing characters to the wonders of Realmspace." 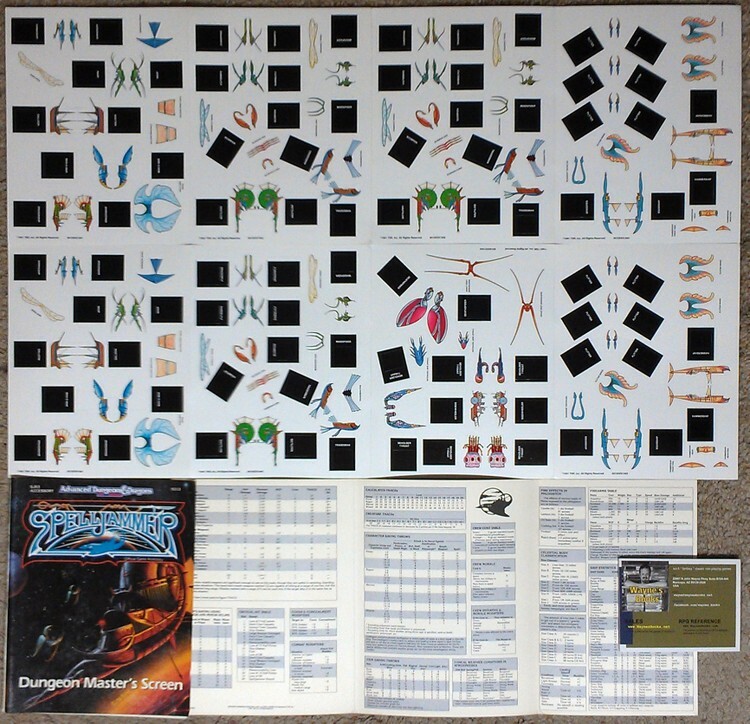 Contents include a folded cover sheet, 3-panel DM screen, and 8 sheets of punch-out ships. "This all new AD&D Dungeon Master's Screen has been designed for use with the SPELLJAMMER campaign system. From basic combat tables to planetary statistics, the screen provides all the special tables needed to smoothly run an AD&D space campaign, placing them immediately within the DM's reach. * combat statistics for your favorite ships from Lost Ships and the SPELLJAMMER campaign adventures! * full color three-dimensional fold-ups of space-faring ships suitable for use in ship-to-ship combat"
"Groundlings have no idea, but any spelljamming adventurer worth his salt knows the universe is huge! 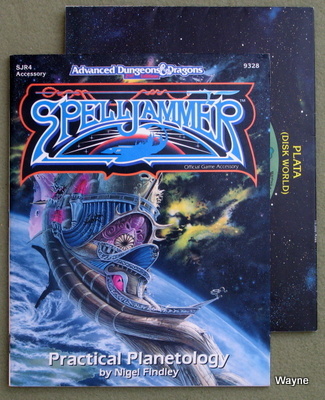 Let Practical Planetology open new possibilites for your AD&D SPELLJAMMER campaign. Practical Planetology contains material suitable for characters of any level." "Welcome to the city of twilight, the city of thieves, the city among the stars. Founded by pirates, Bral is now a prosperous city of rogues and merchants, adrift in the vast realms of Wildspace. Its docks are crowded with graceful ships, its streets are teeming with intrigue and adventure, and its population includes shining heroes and dark villains. The Rock of Bral is a haven for any adventurer with a quick wit and a dash of greed - oppurtunity only awaits the hand bold enough to seize it! 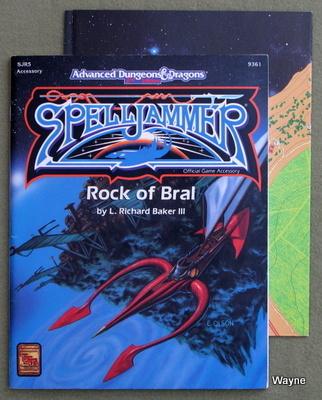 Rock of Bral is an accessory to the SPELLJAMMER campaign setting and is intended to provide a ready guide to this most fascinating of cities. Your character will find the Rock to be the perfect base from which to explore the magical reaches of Wildspace." Unlike Realmspace and Krynnspace, Greyspace was not issued with a poster map. Connects to the world of Greyhawk. "Although Oerth is the dominant world in Greyspace, it is definitely not the only cradle of life in this system. Worlds such as Kule, Borka, and Edill have their own civilizations. Each has its own secrets to entice and threaten explorers courageous enough to brave the perils of Wildspace. This book details the dragons of Edill, the undead of Gnibile, the humanoids of Borka, and many others. It describes their societies, their views of the universe around them, and their relationships to the other inhabitants of the Greyspace system. But the planetary denizens of Greyspace are not the only challenges awaiting brave adventurers! There are also spacefaring companies and starborn peddlers, adventuring groups, explorers' societies, and interplanetary pirates. In addition, the crystal sphere is home to monsters totally unlike those encountered anywhere else: the porton, the skykine, and the dreaded horg. 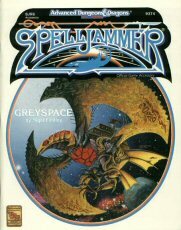 Greyspace is a 96-page accessory for the SPELLJAMMER campaign setting. The SPELLJAMMER boxed set is needed to use this product. The material in this accessory will enhance any GREYHAWK campaign in which the concept of spelljamming has been (or is about to be!) introduced. Your players are in for new excitement!" 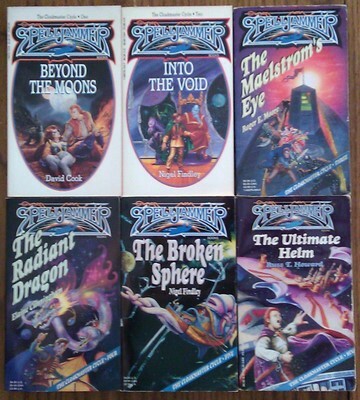 Connects to the world of Dragonlance. "For centuries, the intelligent races of Krynn have looked upward, toward the moons, planets, stars, and the very crystal sphere of Krynnspace. They have looked up and wondered, and gone back to their planetbound lives. Meanwhile, on other worlds in other spheres, spelljamming ships have begun to venture into the Void; they have encountered vast evil - and vast wealth - in the trackless reaches of wildspace. Their ships have explored their own spheres and are even now moving toward Krynnspace. And on Krynn, the art of spelljamming is stirring. Unbeknowst to most of the inhabitants, spelljamming ports are opening. 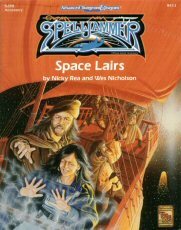 Spelljammers from other spheres are exploring the planet, and explorers from Krynn are rising into the sky and into space. Soon the mysteries of Reorx, Chislev, the Black Clouds, and the dark planet Nehzmyth will be yielded up - or will destroy those seeking to investigate. 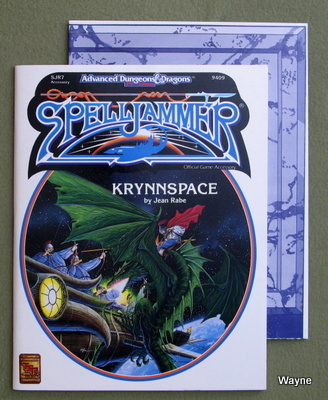 Now you can add spelljamming to your Krynn-based campaign with Krynnspace, an accessory for the SPELLJAMMER campaign setting. 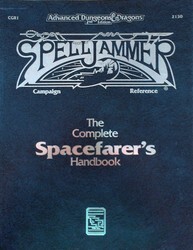 The SPELLJAMMER boxed set is needed to use this booklet. * Details on the planets, moons, and special mysteries of Krynnspace. * Statistics for all the major NPCs who inhabit the planets, or who roam wildspace as privateers or pirates. * Statistics and descriptions for new monsters, magical items, and encounters. * Short adventure hooks to make designing Krynnspace scenarios a snap. SPECIAL BONUS: A full-sized map of the Krynnspace crystal sphere, showing all the planets and their orbits." ""Avast, me hearties, and listen to me tales o' monsters that lair in the vastness of wildspace and the fiery streams o' the phlogiston. Great and terrible beasties they be, just waitin' for a daring band o' adventurers to stumble upon 'em - or seek 'em out! Here's a toast to those brave enough to face the challenge!" Wildspace and the phlogiston are vast. Even when ships travel at spelljamming speed, a journey can take months to complete. Now a DUNGEON MASTER can inject the unexpected into those days when "nothing happens" with the exciting encounters found in Space Lairs. Like the original ADVANCED DUNGEONS & DRAGONS Book of Lairs, this collection contains 14 intriguing and innovative mini-adventures that can be inserted into any SPELLJAMMER campaign with little or no prepartion by the DUNGEON MASTER. 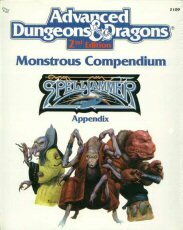 Featuring SPELLJAMMER monsters from the MONSTROUS COMPENDIUM, these adventures provide challenges suitable for players of all levels. 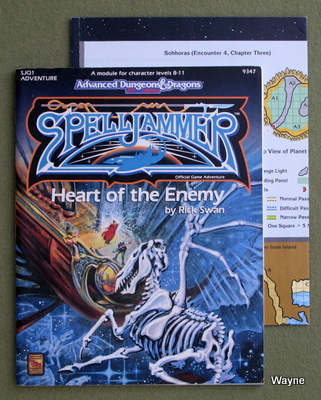 From puzzle-solving to action and from humor to high adventure, it's all here in this 64-page accessory for the SPELLJAMMER campaign setting. The SPELLJAMMER Adventures in Space boxed set is needed to use this book. So, come aboard, take the helm, and prepare to meet Blackleg Bart and lots of other fantastic adversaries!" "On a busy day in the marketplace, something hurtles down out of a clear sky. When the dust clears, you see that it's a ship's anchor, attached to a rope that stretches up as far as you can see. What do you do? Pull your AD&D game players up the rope and into the astounding universe of fantasy space! Send their spacegoing galleon, the Skyrunner, across the vast reaches of Wildspace. Drop them in the Hive, the largest dungeon ever created. Then pit them against the Ravager, a monster that threatens the characers' entire homeworld! 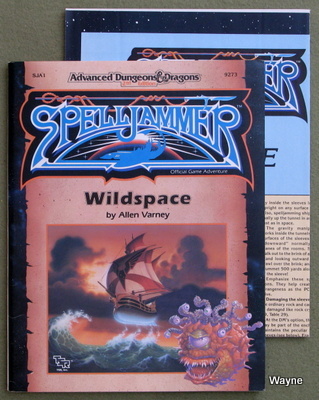 Wildspace is the first adventure for the AD&D SPELLJAMMER Campaign Set. The SPELLJAMMER boxed set is required to play. This 64-page adventure fits easily into your exisiting campaign, as either a change of pace from groundling adventures or the beginning of a new career in space. This adventure is designed for four to six player characters of levels 6 to 8." "Different worlds have different laws. But everywhere you go, you're going to find people who bend and break those laws and turn a healthy profit doing it. Whether sailing the high seas or the Flow, they are called pirates. It's these pirates that you've been hired to hunt. With letters of marque in your mapcase, your job is to track down and capture, alive or dead, some of the most dangerous characters in the known (and unknown) spheres. Of course, not everyone in space is a pirate. You'll also meet Torgan Betz (a man famous for bending the laws, rarely breaking them), Tiktitik, the Thri-kreen crusader, "Thought Taker," the illithid, and the feared Drow commander Teela Darkcloud. Even so, they all have their personal agendas, and it's often hard to tell enemies from friends. 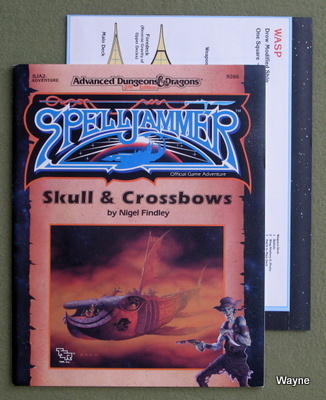 Skull & Crossbows is an anthology of adventures for the SPELLJAMMER campaign setting. This 64-page anthology easily follows Wildspace, but can be used in any existing AD&D SPELLJAMMER campaign. This adventure is designed for a party of four to six characters, levels 6 to 10." The third panel of the cover is a ship card: A Hummingbird ship. This adventure is designed for four to eight characters of levels 5 to 7." "Few creatures inhabiting the realms of Greyspace, Krynnspace, and Realmspace know (or even dream) of each others' existence. Fewer still understand the celestial bonds they secretly share. As the worlds of men and elves, dwarves and dragons are about to discover, no less than TWELVE unknown spheres stand poised for war...a war as unexpected as it will be devastating! Twelve spheres against three - hardly fair odds. But then again, Emperor Vulkaran the Dark, Master of the Twelve Spheres and Ruler of All Known Space, doesn't like a fair fight. He's never fought one yet! 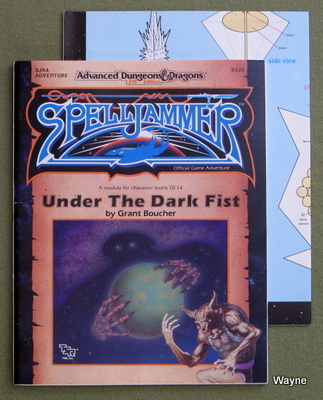 Under the Dark Fist, a 64-page aventure for the SPELLJAMMER setting, provides enough material to wage an intergalactic war across 15 spheres! It can be used as an epic stand-alone adventure or easily incorporated into an existing campaign. This challenging adventure is recommended for experienced players and referees. This adventure is designed for a party of four to eight characters, levels 10 to 14." "Hundreds of years ago, the elves and goblinkin fought for control of known space in the Unhuman War. The elves emerged victorious and the goblinkin were driven out to lick their wounds and plot revenge for another day. After centuries of plotting and building, a new race of advanced orcs known as the scro have rallied the goblins, hobgoblins, and kobolds. It is only a matter of time before they infiltrate known space to wreak destruction on the inhabited planets. The elves are looking for a few good adventurers to infiltrate a scro base and steal any information valuable to the war effort. Your PCs are offered the chance to become heroes - or die trying. Goblins' Return is a 64-page adventure set in the second Unhuman War. The first of a two-part module series, it can later be linked with Heart of the Enemy or it can be played as a stand-alone adventure. Goblins' Return is designed for four to six characters of levels 7-10." "A little information is a very frightening thing. Heart of the Enemy is a 96-page adventure set in the Second Unhuman War. The second of a two-part series, it can either be linked with the previous Goblins' Return or it can be played as a stand-alone adventure. Heart of the Enemy is designed for four to six characters of levels 8-11." 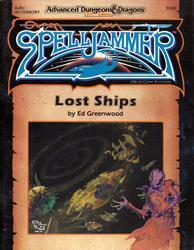 "Out of the depths of wildspace come astonishing new ideas for SPELLJAMMER campaigns. Now you can create player characters from the nonhuman races of the giff, dracons, scro, grommams, and more. Equip you characters with kits like the Corsair, War Mage, and Aperusa. Then add some new space-oriented proficiencies and equipment, enlist your character in a spacefaring organization, and head off into the Void!" CREATURES: Aartuk; Albari; Ancient Mariner; Argos; Astereater; Beholder-Kin (Director, Examiner, Lensman, Overseer, Watcher); Blazozoid; Chattur; Clockwork Horror; Colossus; Delphinid; Dizantar; Esthetic; Focoid; Fractine; Giant, Spacesea; Golem, Furnace; Golem, Radiant; Gravislayer; Grommam; Hadozee; Hamster, Giant Space; Jammer Leech; Lakshu; Lumineaux; Lutum (Mud-Woman); Mimic, Space; Misi; Moon, Rogue; Mortiss; Murderoid; Nay-Churr; Phlog-Crawler; Pirate of Gith; Plasman; Plasmoid (DeGleash, DelNoric, Ontalak); Puffer; Q'nidar; Rastipede; Reigar; Rock Hopper; Slinker; Spider, Asteroid; Spiritjam; Survivor; Syllix; Symbiont; Vine, Infinity; Wiggle (Hurwaet); Wizshade; Wryback; Zard; Zodar. "Thought you'd seen it all when you met the neogi? Threw up your hands in horror at the sight of space barnacles? Well...get ready for the giant space hamsters, the symbionts, and lots of other wild and weird SPELLJAMMER campaign monsters! In this product are some of the most fantastic creatures ever seen (or not seen, as the case may be), in wildspace or out of it. Yes, Virginia, there really are giant space hamsters lurking in these pages, as well as whole new races ready for the DM to launch into a SPELLJAMMER campaign. Once again, there are 64 pages of new beasties for your playing enjoyment, 5-hole punched and ready for insertion in your Monstrous Compendium binder. Plus, the great (4) full-color divider pages with identification tabs make it easier to organize your critters. 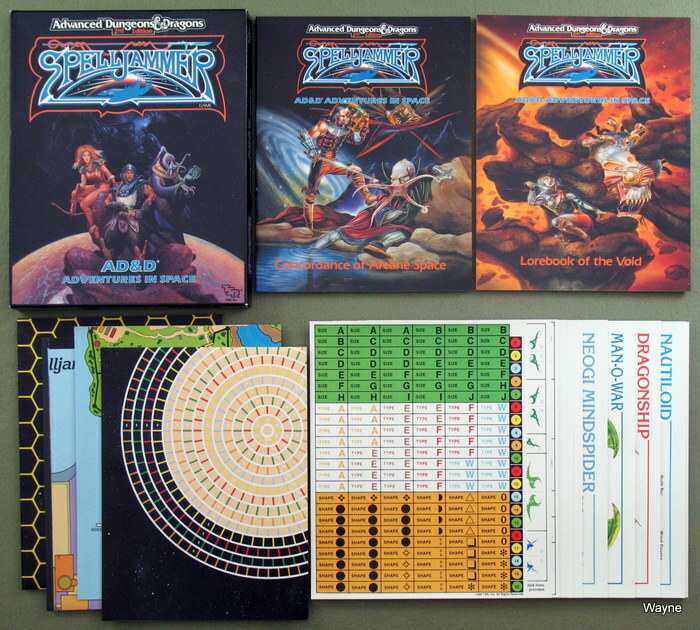 SPELJAMMER campaigns will never be the same again..."
CREATURES: Alchemy Plant; Allura; Aperusa; Autognome; Bionoid; Bloodsac; Buzzjewel; Constellate; Contemplator; Dohwar; Dragon, Moon; Dragon, Sun; Dragon, Stellar; Dreamslayer; Dweomerborn; Fal; Feesu; Firebird; Firelich; Flowfiend; Gadabout; Gammaroid; Gonn; Gossamer; Grav; Great Dreamer; Greatswan; Grell, Colonial; Gullion; Insectare; Lhee; Mercurial Slime; Meteorspawn; Monitor; Owl, Space; Pristatic; Scro; Selkie, Star; Silatic; Skullbird; Sleek; Sluk; Space Swine; Spirit Warrior; Sphinx, Astro; Starfly Plant; Stargazer; Undead, Stellar; Witchlight Marauders; Xixchil; Yitsan; Zurchin. "Prepare to be boarded! Here are still more new, inventive, dangerous, and entertaining creatures and races for your SPELLJAMMER campaign setting! There are giant undead insects, star gypsies, space plants, and much, much more awaiting your stellar travelers in these pages. Elven war-beasts, giant space turtles, orcish death-creatures, and other beings of the phlogiston, crystal spheres, and wildspace roam this volume. Some look nasty, and are; some look nasty, and aren't. Which are which? Read the entries and find out for yourself! And of course, they are organized into five-hole-punched pages that fit right into your Monstrous Compenium binders." The Spelljammer adventures of Teldin Moore. 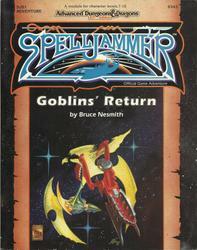 Wizards of the Coast owns (and holds trademark to) the AD&D game and Spelljammer in all forms.